At the February 17, 2015 regular meeting of the Clackamas County Soil and Water Conservation District, the Board of Directors adopted a supplemental budget, adopted a revised budget, and appropriated funds for fiscal year 2014-2015 (July 1, 2014 through June 30, 2015). What does this mean? It means the District made some adjustments to the budget in the middle of the current fiscal year. 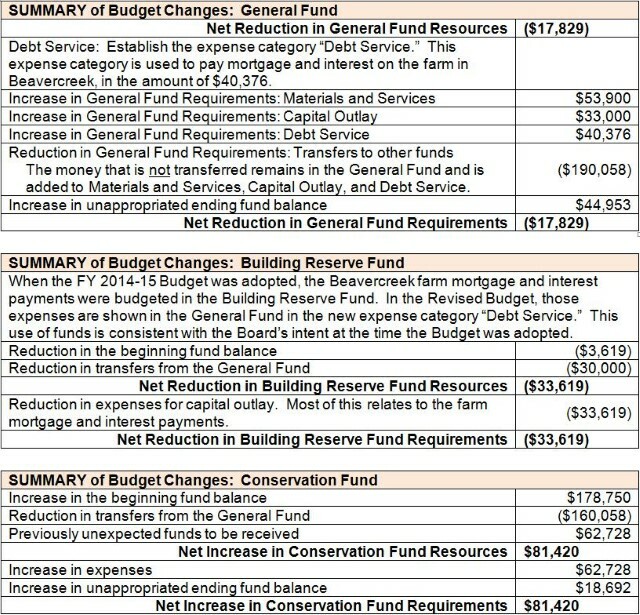 Oregon Local Budget Law specifies what the District must do when making changes to an adopted budget. After determining that a public hearing was not required, the District followed its usual practice of publishing the meeting agenda the week before the Board of Directors meeting. Our most recent audit found that we needed to change the way we report the revenue and expenses related to debt incurred by the District. The District estimates the beginning cash available nearly four months before the budget becomes effective, so the District chose to adjust the budget to reflect how much cash we actually had on hand on July 1, 2015. The District anticipates receiving more tax revenue than originally expected. The District also received several project-related grants that were not anticipated during the budgeting process last spring. The District must appropriate funds before they can be spent, so the budget was modified to reflect the additional revenue, and then those funds were appropriate. These funds support assistance to customers and help support District operations. If you have questions about these changes, please contact General Manager Tom Salzer at (503) 210-6001.